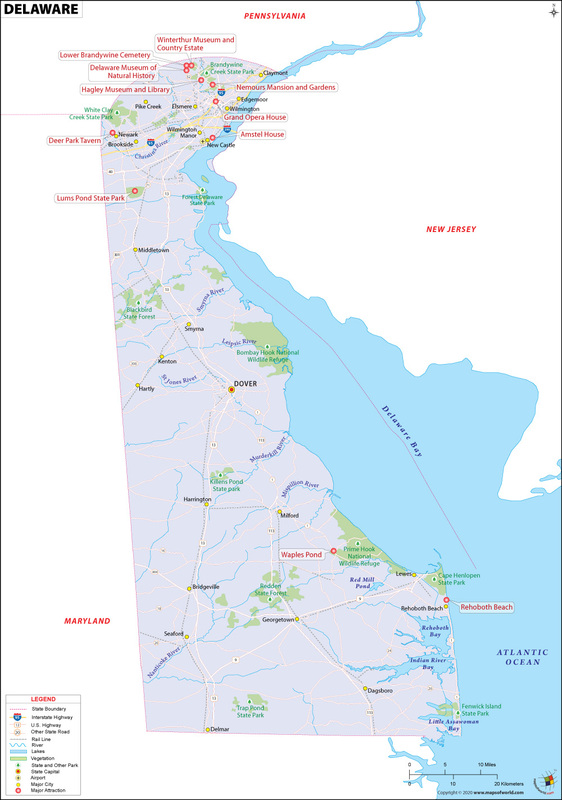 Explore map of Delaware; a state located in the Northeastern or Mid-Atlantic region of the United States. Comprising an area of 1,982 square miles, it is the second smallest of the 50 states of the United States. With a population of 952,065 people, as of 2016, it is the 45th most populous state of the country. However, it is the sixth most densely populated state. Dover is the capital of Delaware and Wilmington is the largest city of the state. Delaware shares its borders with the states of Maryland, New Jersey, and Pennsylvania. With a height of 136.50 meters, Ebright Azimuth is the highest point in the state. Nicknamed the First State as it was the first state to ratify the Constitution of the United States, Delaware was admitted to the Union on December 7, 1787.
: The Delaware map depicts the major cities and the state capital. Also shown are the rail lines, airports, interstate highways, US federal highways, state parks, rivers, major attractions etc. Delaware is a state in the United States located in the Mid-Atlantic region. It is located on the Atlantic Coast, and is the 2nd smallest state in the country. It is also the 6th least populous with the fewest number of counties of any state. The name Delaware is taken from the Delaware River, which is named after English nobleman and first colonial governor of Virginia, Thomas West, the 3rd Baron De La Warr. The state is also known as "The First State," for being the first to receive statehood in the US. Several groups of American Indian tribes had inhabited the region when the first Europeans arrived. The major tribes were the Lenape in the north and the Nanticoke in the south. One of the very first European arrivals recorded was in 1609, when Dutch Henry Hudson explored the region. By 1631, Dutch traders started to settle at Zwaanendael, near Lewis. By 1638, the Swedes established a trading post and colony at Fort Christina, calling the land New Sweden. In 1651, the Dutch returned and conquered New Sweden, who were then conquered by a British fleet of ships in 1664. By 1681, King Charles II granted the region, which was part of the Pennsylvania territory, to William Penn. In 1776, after the American Revolution, the Declaration of Independence was signed, which freed the Province of Pennsylvania from the British, and this separated Delaware from the territory. Delaware was also one of the 13 colonies that participated in the American Revolution, and on December 7, 1787, became the first state of the Commonwealth of the United States. Delaware is the second smallest state in the US, coming in next to Rhode Island. The state is only 100 miles long and 30 miles wide. It is bordered by Maryland to the south and west, New Jersey to the northeast, and Pennsylvania to the north. It has the fewest numbers of counties in the US - making up only 3 counties: New Castle, Kent, and Sussex. Its highest peak is only at 450 feet above sea level, which is found in a mobile home park west of Ebright Road. Delaware is a charming state with its fair share of top tourist attractions. From sandy beaches to historic sites and outdoor attractions, the state has something to offer for every kind of tourist. Rehoboth Beach is the most popular beach in the state, with a mile-long boardwalk and plenty of opportunities to enjoy a wide range of water activities. The Riverfront Wilmington is filled with dining, shopping, and entertainment opportunities, beloved by locals and tourists alike. Frightland is a unique amusement park with a horror theme, dubbed as one of America's scariest Halloween attractions. But the most iconic attractions that define the state are that of the Du Pont mansions that are now used as museums and libraries. The Hagley Museum and Library has exhibitions of the most unique and significant American innovations, while the Winterthur Museum, Garden, and Library is a beautiful 175-room mansion that shows tourists what it was like to live luxuriously in Delaware in the 1800's. There are over 40 public school districts in Delaware, with over 200 public schools and over 100 private institutions. The top 5 universities in the state are the University of Delaware, which is the largest; the Wilmington University in New Castle; the Delaware State University in Dover with an excellent program in education; the oldest private university of Wesley College; and the Widener University established in 1821.